Posted on January 3, 2018 , in Hot Tubs. The great thing about hot tubs is you can install them outside or inside your home. Many homeowners opt to install their units inside so they don’t need to endure less than favorable weather conditions to get to their hot tub. 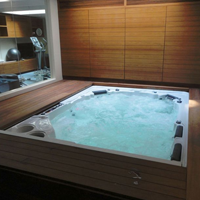 If you’ve been considering installing your hot tub inside, you likely know that the basement is an ideal location. The concrete floors can bear the weight of a full hot tub and there’s usually under-utilized space in a basement. However, there are some factors you need to consider before you install a hot tub in your basement. We don’t need to tell you that a hot tub has hot water in it. But, what you might have failed to think about is that hot water can increase the humidity in your basement and cause condensation. Humidity can ruin furniture and wallpaper in your basement. Condensation, if not dried properly, can also encourage mold growth in your windows, walls, and heating ducts. To combat the increased moisture in the air, you’ll need to ensure your basement can ventilate properly. For battling the increased humidity, you can use a furnace in the winter and a central air system in the summer. These methods, however, will not get rid of condensation. To best remove condensation, you’ll need an exhaust fan to vent the air to outside your home. If you’ve ever slipped and fallen on concrete, you know how much it hurts and how much damage it can do to your body. When you install a hot tub in your basement, water that splashed out of the unit will cause your floors to be extra-slippery. After installing your hot tub, surround it with anti-slip materials like rubber mats to help prevent falls. You will also want to ensure you can properly drain any water that gets out of your hot tub so it doesn’t cause structural damage. Moisture-resistant flooring and a well-placed drain can help. When installing a hot tub in your basement, you should also ask a contractor or architect who is experienced in hot tub installations to check out the area where you want to install the unit. A professional contractor will tell you the best location to install your hot tub, where and how to ventilate it, and discuss your drainage options. They might also recommend other materials like moisture-resistant insulation. Having a hot tub in your basement is a great investment for you and your family. You can reap all the health benefits like relaxation, massages, and sports injury recovery. If you invest the time to ensure your hot tub has the proper ventilation, flooring, and drainage, you’ll be able to enjoy your hot tub for many years. To learn more about different hot tub models and features, download our hot tub buyer’s guide.